Up to the end of the 1800s, local natural resources of geological materials in the six townships of Tatham and Melling parishes (excluding Arkholme) were an important provider both of products for use and income for labourers and owners. 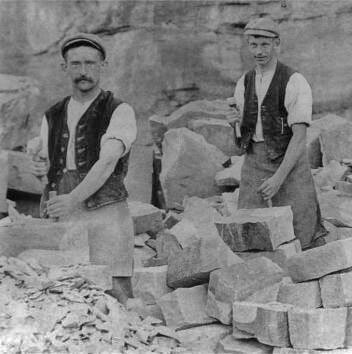 Amongst these, sandstone was widely used for construction purposes, e.g. 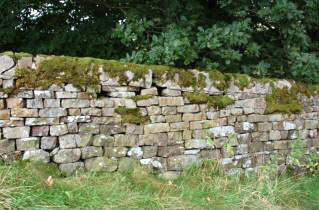 houses, barns, shippons, bridges, as well as for field walls and the bank (kop) of hedges. In addition, sand, and lime from limestone, were used for the mortar in the buildings. The ownership of these resources was vested in the mineral rights, initially held by the Lord of the Manor, who generally retained them when selling off freehold property. 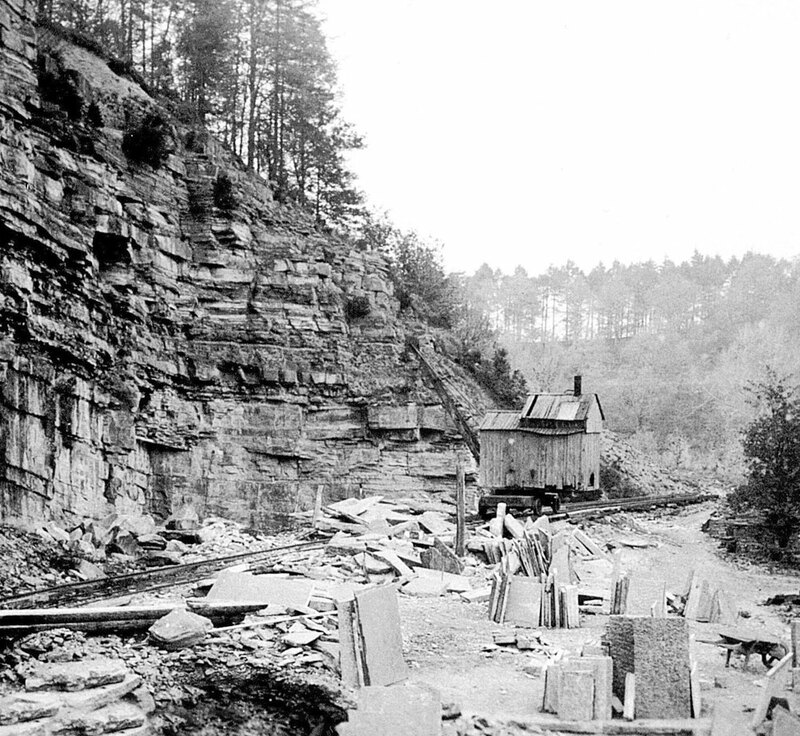 However, this was not always the case and disputes arose when ownership was uncertain, with coal mining providing several examples. Whilst the ownership of the mineral rights for the main sites of sandstone extraction is generally clear it is usually unknown for the numerous minor sites and it is possible that it was in any case ignored. This stone is derived mainly from the sandstones of Carboniferous age which are one of the main bedrocks of the local area.1,2 Other rocks from outside the area have had only limited and specialist usage. e.g. the Ordovician sandstone flags of Ingleton and Horton and, more recently, similar aged slates for roofs from the Lake District and North Wales. The local sandstones were originally deposited as sand at various times around 300 million years ago, both by rivers on flood plains and by submarine currents on huge submerged deltas in the sea. They were subsequently turned to rock and now outcrop on the land surface. The sandstones are mainly composed of grains of the hard glassy mineral quartz, with a slight amount of very fine iron oxide giving the sandstone its colour. A common minor constituent are shiny mica flakes. Grain sizes vary from fine to coarse (0.6 to 2 mm). There is also a variation in the amount and type of natural cement binding the grains together, which was introduced in solution and precipitated sometime after the sand was deposited. Most are lightly cemented by quartz and retain some open pore space (porosity). Others (ganisters), are tightly cemented by quartz and are extremely hard. In contrast, sandstones cemented by the soft mineral calcite are able to be split easily, i.e. are freestones. Another important property is the thickness of the sandstone bed between the bedding planes, which varies from millimetres to metres, with the beds being separated by finer grained sediment, from thin films of mica flakes to beds of siltstone or mudstone (shale) of any thickness. The thickness will determine the usage, e.g. 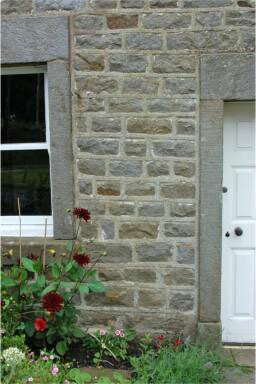 varying from thin roofing slates to thick quoins and lintels. 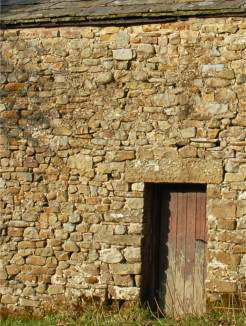 General building needs are less prescriptive whilst field walls make do with whatever is available. Natural fractures (joints) in the rock, together with bedding planes, define the maximum size of a stone block. Typically, in these rocks, the fractures conveniently form a pattern at right angles to the bedding. Sandstone was obtained from two different sources: bedrock and superficial deposits. The first was exploited by quarrying the bedrock outcrops (Fig. 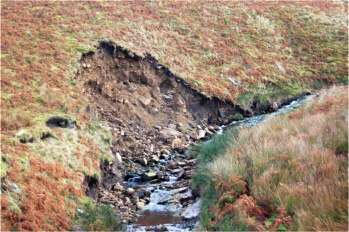 1), which are relatively scarce in this area because of the extensive cover of the superficial deposits (Fig. 1d). This second source was exploited by gathering individual stones from the naturally eroded sandstone blocks they contain. The most important of the latter are the glacial deposits of till (mixtures of boulders, sand & clay) laid down by the ice sheet when it melted away about 15 thousand years ago, and the gravel, sands and muds deposited by the melt water (Fig. 2). The rock fragments in these deposits were eroded from bedrock outcrops by the ice sheet and transported to their present position. Typically they also contain erratics, i.e. rock types which are alien to the area, including limestones from the Pennines and hard bluish fine grained sandstones (often with a white crust) from the Howgill fells. Another category are slope deposits (head) formed from debris weathered from bedrock and transported down slope as a sludge under cold climatic conditions. The third category are the river deposits of the present river bed and the adjacent terraces, which are mostly derived from the previous two categories, especially glacial, with the river only locally eroding bedrock. 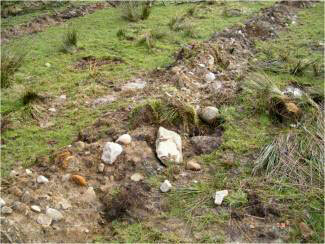 These deposits were mainly exploited in an informal way, when and where they were needed, by gathering and digging. However, it is clear from the evidence of the stone in the buildings and field walls that these superficial sources were important. The clue to the source of a stone block is its shape. Quarried material, termed dimension stone, has a size and shape determined by the natural fractures and bedding planes together with the artificial fractures made by the quarryman, splitting and dressing the stone to obtain the desired size and shape. Characteristically, the dressed stones and the quarry waste are angular in shape, i.e. retain sharp angles between the faces. In secondary sources, the rock has been naturally quarried, with the size and shape of the blocks determined by the natural fractures but modified by abrasion caused by collisions during transport by the ice and/or water. Thus, a sub-angular shape is characteristic of glacial tills and the river deposits reworked from the till. A sub-rounded shape, due to more intensive abrasion, is characteristic of glacial gravels and river gravels reworked from them, or produced by prolonged river transport itself. However, blocks in slope deposits, and river deposits reworked from them, may be less abraded. Occasionally, the shape may be affected by splitting and dressing by the user. The foregoing illustrates that there is an overlap between the processes involved and, hence, the interpretation of source is to a degree uncertain. in Tatham and Melling parishes and adjacent areas. 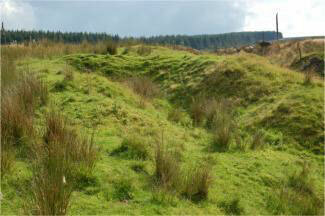 Forty five stone quarries are known from Tatham and Melling parishes (Fig. 3). Around two thirds of these (28) are present on the first edition of the OS map surveyed in 1844 and therefore were opened before that date. The remainder, differentiated on the map by a black margin, were identified from other sources or by field work. 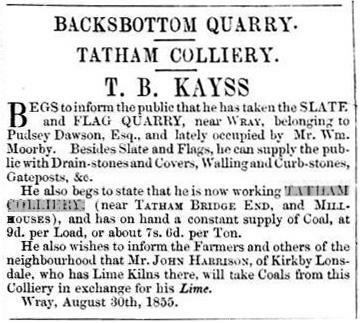 Whilst many of these post-date 1844, some are likely to be older, for example, the small quarries west of Wray were probably opened for walling stone in connection with the enclosure of Wray Moor in 1804.4 Only nine were large enough to be considered significant commercial ventures. Other quarries are shown from the adjacent parts of Caton and Bentham parishes which did, or may have, supplied stone to the local area.5 It is likely that this compilation is incomplete. Little is known of the early history of quarrying but it was obviously driven by the demand for dimension stone for building and, with less stringent requirements, for walling. Amongst the earliest stone buildings would have been Hornby Castle and Melling and Tatham Churches and parts of the present structures go back to the 15th-16th centuries whilst sources suggest considerably older dates for their establishment.7 Widespread stone usage probably waited until the rebuilding of wattle and daub or turf and stone dwellings and farm buildings in stone, termed the Great Rebuilding, which date stones show to have taken place in the 1600s.8 Many small quarries would be opened for a single building or walling project and had a short life, whilst the larger ones were commercial operations and lasted for longer, some into the early 1900s. The local Carboniferous sandstone quarrying was, of course, part of a widespread industry in the Lune valley9 and elsewhere in Lancashire, which locally had at least a 500 year lifespan. Quarrymen and stone masons recorded in censuses 1851-1901 and the number of individual quarrymen named by Smith for 1819-28 and 1829-38. The later history of the industry as a whole can be gained from the 1851-1901 censuses which reveal its changing vitality, with lows in 1861 and 1891 (Table 1).10 Also shown is its regional concentration in Wray, i.e. at Backsbottom quarries. Stonemason numbers similarly reflect the quarrying industry's activity, although it is not clear whether any of them worked in the quarry rather than at building sites or their own workshops. The sudden increase in their numbers in Hornby in 1881, and the return of quarrymen to Melling, was due to the rebuilding of Hornby Castle by William Foster, with many of them boarding in Hornby and having birthplaces as far afield as Ireland. 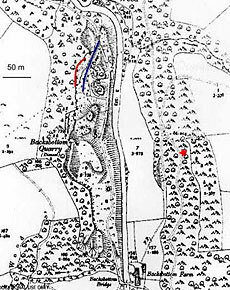 More detailed information is only available for the quarries of Hornby Castle Estate, which comes mainly from the diary of George Smith, from 1819-38 assistant to George Wright, steward of Hornby Castle Estate under the ownership of John Marsden and, after the Estate changed hands, then working independently until his death in 1856.5 His records show that quarrying was active back to 1819, with all the main Estate quarries operational, together with several smaller ones, e.g. Windybank, Hornby and Jones Bank (= Coat Bank? ), Tatham. His data in Table 1, of course, is selective and not comparable to census values. In addition he attests to the existence of non-estate quarries from which he bought stone, e.g. slabs and slates from Nutgill and Caton Moor. 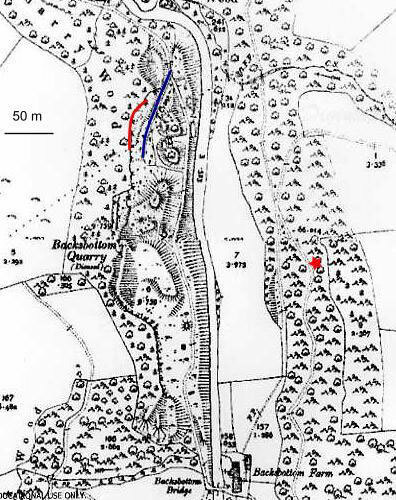 There seem to have been several ways in which the Hornby Estate managed their quarries. Smith records the letting of whole quarries, e.g. £20 p.a. asked for Cockshotts, Melling (1819), or for a rid (section) of a quarry, e.g. “rid at Backsbottom let to Edward Blezard & Co” (i.e. others) (1821).5 The Estate then bought finished stone from them, e.g. “gateposts and all the stock of flags and slates from Blezard”. Also, in 1821 Richard Wilkinson offered to get and dress flags at 7d / sq yd and slate at 1/- sq yd (rood in transcribed original should be rod) and later signed a contract to that effect. Presumably the tenants also sold to other customers. However, a quarryman might act as an agent selling stone on behalf of the Estate, keeping records and transferring payments to them, e.g. Robert Ripley paid £144 for 3 months from work at Backsbottom. The availability from these sources of ready made building material varied over time. Initially, after melting of the ice sheet, the ground surface would be strewn with blocks of stone of all sizes, including not only local sandstone but also far travelled erratics of limestone and Ordovician sandstone. Much later, these would have been harvested during land clearance in the initial stages of farming in the area and utilised for field walls, hedge kops and early buildings. However, there was not such a surplus as in some areas, e.g. Lake District mountains, where rock piles were built in the fields. The early post-glacial period was one of intense erosion by rivers of the glacial deposits, initially unhindered by vegetation, which built up boulder gravel and sand deposits in the valleys. These now constitute the terraces being eroded by the present Wenning, Hindburn and Roeburn rivers and their tributaries, forming the deposits in their beds which have been an important source of building and walling stone over a long period. 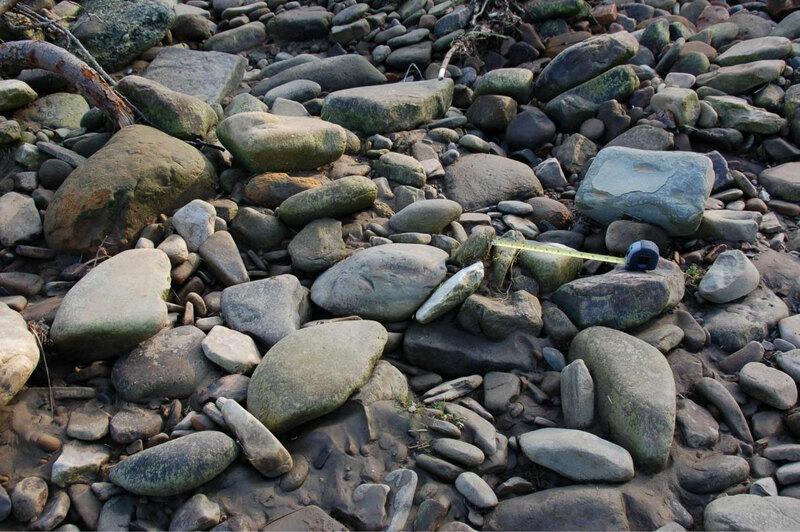 There is a record of river stone being harvested from the Roeburn in 1889 by Richard Kenyon of Wray for the construction of a house there (Roeburn House). The stone was dressed enough to put a face on it and it was used for all the walls except the front, which was Backsbottom Quarry stone.4 For brevity here, stone probably taken from river deposits is termed river stone and that from glacial till field stone. 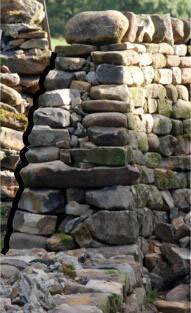 The structure of a dry stone wall (no mortar) is shown by Fig. 6a, with a double battered (tapering) wall of roughly sized and coursed stones; packed with small stone; with one or two discontinuous layers of through stones for stability and finished with large top stones of similar or alternate sizes. Occasionally, very large boulders would be incorporated in the bottom. Ideally, individual stones were laid flat, i.e. on their bedding plane surface, and the courses would be horizontal, even on slopes (Fig. 6c). 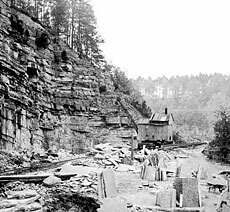 Field wall construction would use the stone nearest to hand, field clearance stone for the earliest, river stone and small quarries opened specifically for that purpose or quarry waste. 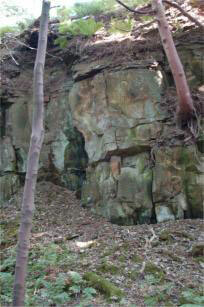 No written evidence exists of the association of a quarry with an actual wall, but their proximity is suggestive, e.g. the stone for a bridge wall (Fig. 6c) may have come from the nearby small quarry in the Ward's Stone Sandstone near Swans. 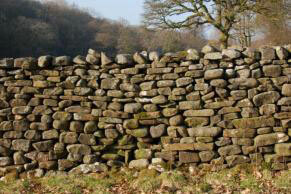 Similarly, the quarried stone wall on the west side of the road to Moorcock was probably sourced in the Roeburndale Sandstone at Willey Close Quarry on the edge of the fell, whereas the wall on the other side of the road is field or river stone. Also, quarried stone could result from reuse of building stone. The outside walls of stone buildings were usually built of two parallel skins or leaves of stone laid on lime mortar, with small stones packed between them. Over time, there was an increased desire for smoothness and regularity of the wall, at least at the front of a dwelling (Fig. 7a-c) The earliest are rubble walls of randomly laid stone, roughly coursed and irregularly sized vertically, the stone being mainly field or river stone. In contrast, walls of quarried dimension stone are uniformly coursed, and either have an undressed or specially dressed front face. 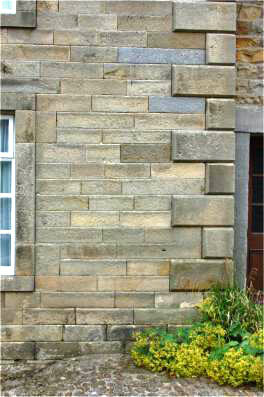 Ashlar stone represents the most extreme example of preparation, laid with very thin pointing. Even with rubble walls, the quoins and lintels were dressed and either quarried or carefully selected from natural sources. 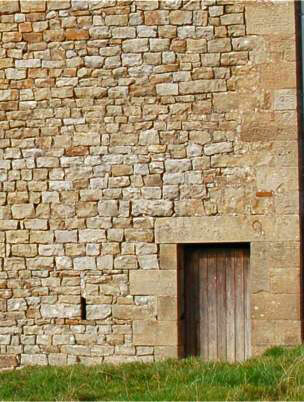 Later buildings also incorporated stone surrounds for doorways and windows and, for a period, mullions. Farm buildings had less particular requirements than dwellings and were generally rubble walls, although later ones could be lightly dressed quarried stone (Fig. 8). 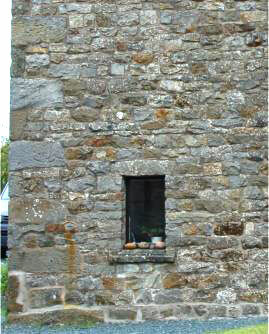 Lime mortar, i.e. sand and lime, was a necessary component in the construction of sandstone buildings. Cement mortar based on calcium silicate was not patented until 1824 and only gradually became used in the late 1800s. Lime, in the form of quick lime (calcium oxide), was obtained from calcining ('burning') limestone and a fuel, usually coal, in a kiln. 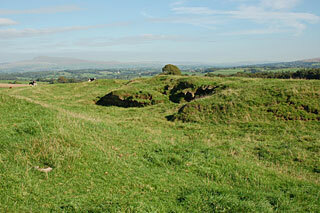 Historically, there were two types of kiln: a clamp kiln comprising a shallow stone lined elongate pit with a stoke hole and flue at one end, in which a mound of limestone and coal was covered with turf.14 The other type, pot kilns, are the familiar stone structures with tapering sides, an open top, access hole and flue at the base. The local area lime kilns include two probable clamp kilns: at Thrushgill, where field stones would have been the source, and near Balshaw Bridge, where river stones were the likely source. Another likely clamp kiln is the one on Wennington Green shown on 1844 OS map and specifically mentioned in Smith's diary between 1824-41.5 Here the source was obviously the gravels in the bed of the River Wenning, where limestone cobbles form about 40 % of this sediment size. This type of source was presumably used also for the possible clamp kiln down Kiln Lane in Wray, although limestone there forms only about 10% of this sediment size. Here they seem to have been dug from the edge of the river terrace and a nearby conical mound may be the discarded material. 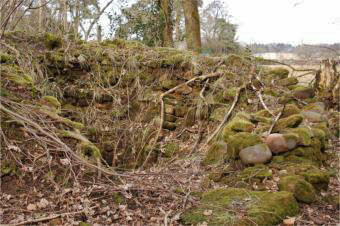 However, the site is complicated by workings associated with the old railway bridge over the Roeburn. An hitherto undescribed small pot kiln, 3 m high by 4 m diameter, lies adjacent to a quarry in the Silver Hills Sandstone which was used for stone for the only partially completed reconstruction of the weir for the Wennington Corn Mill (undated). Again, river gravels would be the limestone source. There are another ten sites in Tatham parish for which a kiln occurs as a name but these need further investigation to distinguish between kilns for lime, iron smelting or grain drying. 1 Brandon, A. & others 1998: Geology of the country around Lancaster. British Geological Survey, London, 181 pp. 2 British Geological Survey 1995: Lancaster Sheet 59, 1:50 000 Series. 3 Kenyon, D. 2008: Wray and District Remembered. David Kenyon, Wray, 238 pp. 4 Kenyon, D. 2014: pers. comm. 8 Garnett, E. 1999 The Dated Buildings of South Lonsdale. Univ. Lancs. 9 Hudson, P 2000: Quarrying and extractive industries. Ch 3 in Winstanley, M. ed. Rural industries of the Lune Valley. CNWRS, Lancaster University. 10 Census records 1851-1901. www.tathamhistory.org.uk. 12 Lancashire Record Office: Wray with Botton Tithe Apportionment 1848. 13 Lancashire Record Office: Hornby Castle Estate sale particulars 1938: DDHH 2/20. 14 Johnson, D. 2010: Limestone industries of the Yorkshire Dales. Amberley Publishing.